It’s true, I had a momentary mind lapse in front of PetSmart, my cart full of a heavy box of litter and canned food, as I watched her coming along. I couldn’t tell if she was going to stop and she didn’t seem to be slowing down, so I paused. Then for a few seconds I turned my head in the other direction to look at some new construction. When I turned back, she had sort of stopped, that is, the van was inching along. That’s when she yelled. I pushed my cart in front of her, willing myself to remain calm and not flip her the finger. I didn’t really feel angry. I considered blowing her a kiss and shouting, “Mellow out honey buns.” But I did feel hurt and violated and a semi-humorous albeit sarcastic response was too nice for her. By the time I got to my car, I wanted to cry. I watched the van charge ahead toward the exit, where she ran into the construction blocking her way out. She then had to zig zag back through the parking lot and through a gas station to find another driveway into the main street. Sadly, I’m used to the rudeness. In La Jolla, mothers in big SUVS texting and cutting other cars off. Businessmen in black Mercedes not stopping in intersections. In Pacific Beach, the impatience of many young people, music booming, trucks bearing down. But this was the first time someone actually yelled. Admittedly, there have been times when I’ve felt impatient crawling through a parking lot behind a group of people not paying attention. Often the same mothers or twenty-somethings who tailgate or rush around on the road but amble, take … their … sweet … time, four abreast, on the sidewalk or in the parking lot aisle. But I would not assault them with words anymore than I would with a gun. Two extra minutes is not going to make a difference in my life. Barring emergencies, does it in anyone’s? Why did this woman, not young or old, in the huge van, feel the need to yell? Her words weighed on my slightly stooping shoulders the rest of the day. 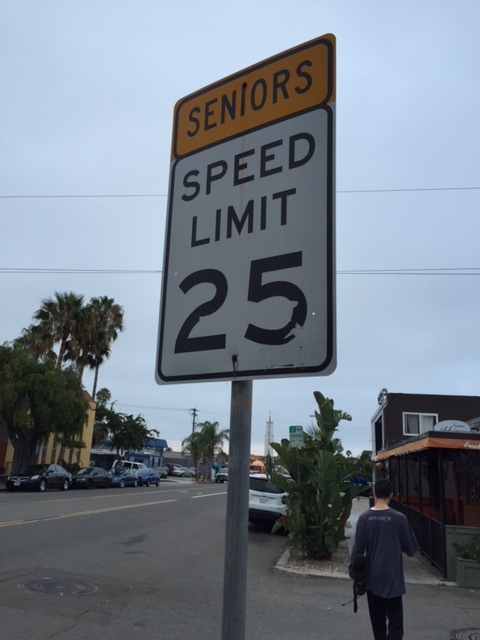 What if I were really old and slow? That day is closer than I care to admit and it makes me sad, really sad, to think further insults await on the road ahead. You were wise to not respond back in anger. Angry drivers can do worse than yell these days. I am even afraid to give them a dirty look, though I may feel as upset as the wonderful graphic at the beginning of your article. Your thoughts make me ponder as to how people will treat me as I age into slowness. That her first exit was blocked by construction is evidence of karma. Such people are their own worst enemies and incite the wrath of the gods. Next Next post: What is Good News?